The FringeGirl is my inspiration today. I will use her as my guide, if you will. 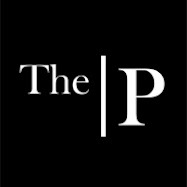 First, she wrote about procrastination and preparation. Her blog was in reference to getting ready for Thanksgiving. Now is the time that I tell you of my family tradition. With the exception of picking out an outfit and making reservations, there are no preparations for Thanksgiving in my family. For, oh, a couple decades now, my mother, sister and I have had a tradition of going out to eat for Thanksgiving. Dad, for years, made a point of going hunting over Thanksgiving. LucyJane's hubby (ex now), made a habit of going windsurfing over Thanksgiving. So, we girls had the very distinct pleasure of enjoying each other's company without fussing over stoves, ovens, pots or pans. We started out going to little joints. Luby's, I think. Then we visited a family run joint in a local, small town. Eventually, our tastes graduated to eating at some of the finest hotels and restaurants in the Dallas area. I don't like turkey much. So, the girls humored me and we landed on our feet in front of some great buffets. Did you know that most of these places have omelets-to-die-for in their Thanksgiving buffet? Bacon, people. In eggs. Out of eggs. Bacon. Does life get better? Fringegirl's next blog was an introduction to FringeMan. If she is FringeGirl, shouldn't he be FringeBoy? I digress. A sweet little story of him and them. So, I will use her as my muse and tell you about me and Snakelover. Here's the scoop: On the 17th of September, 2007, Snakelover read my profile on match.com and he was attracted to my writing skills. How cool is that? I had apparently used spell check. I had included information about the catfish in my pond and the fact that I like God. That I think that frogs and crickets singing in the night are the most wonderful thing. That I sing out loud in the shower. So, that day he said "hi". I looked at his profile and I liked his pictures. He's hot! And, sure. I'm sure he wrote something good. I know he used spell check. I said "hi" back. On September 21, 2007, we met, face to face. And well, here we are 14 months later. So, back to Thanksgiving. This year, I am breaking tradition. The man that I have grown to love, with more of my heart than I knew that I had, has invited me to The Snakelover Family Thanksgiving Celebration. Indeed, I am going to miss out on my family tradition. It would seem that the making of new memories and traditions is on the horizon. Wednesday, Snakelover and I are travelling to Bandera. Snakelover's cousin, Rocky, owns The Bandera Saloon. This fine establishment is closed for business Thanksgiving Day, so, Thursday, we, the entire Snakelover family, are invading the kitchen at the saloon and we are making Thanksgiving (not reservations). Rocky is a chef. Do you think maybe he'll make some bacon for me? When it was decided that Primitiques would have an Open House this coming Saturday, November 29, I had to call Snakelover and ask "do you think we could leave Bandera Saturday at 7am to be back by noon, so that I can be at Primitiques for an Open House at 1?" (You are aware that we live in Texas and it takes 5 hours to get anywhere, aren't you?) The man that I love said, "Listen, if we rush back, people better show up, and they better buy a lot". Ok...no, he didn't. I embellished that to get you to come out. So, there you have it. That is my Thanksgiving Love Story. This is way too long without another picture, isn't it? Ok...here's one. 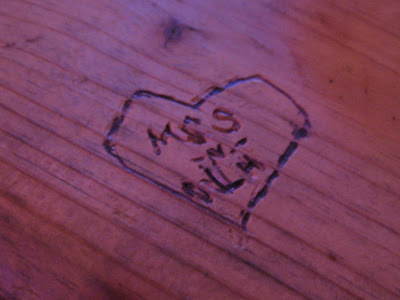 This, I etched into the table at The Bandera Saloon, when we visited in October. This is a love that I intend to cherish for many years to come. How lucky am I? By the way, Dad joins the girls for the Thanksgiving Buffet these days. I think my peeps will miss me, but they will live without me. After all. It's about time I found this kind of love, isn't it? Oh that is just too sweet. Hope you have the best Thanksgiving ever!! Making new memories/traditions are good. 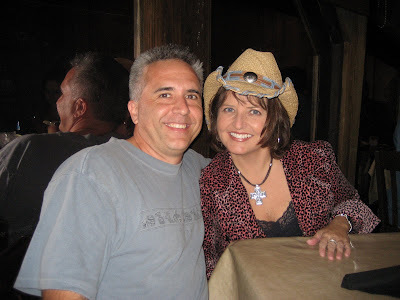 Mindy - You seem so happy in your writing and always look so beautiful in your photos with him. They're very telling. Just a bit of info...my husband and I met on Match.com too. We will celebrate our 6th wedding anniversary tomorrow. Debra, thanks for stopping by! Happy Thanksgiving to you, too. Candy, Thank you so much for your note. And Happy Anniversary! Even though I knew the story, I enjoyed hearing it again. I'm glad you both found each other.